Recently I had the opportunity to attend the first weekend workshop presented by Montessori Partnerships for Georgia (MPG) in collaboration with CDF Action and the International Montessori Training Institute (IMTI). Joen Bettmann, the Director of Training at IMTI, was the featured presenter. 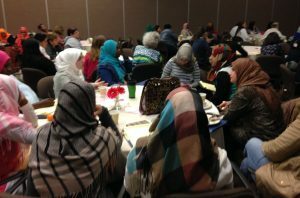 A crowd of sixty early childhood educators, including many from Clarkston’s refugee communities, takes in Montessori concepts. The weekend was filled with exploration, play, and discovery. Close to sixty childcare providers, teachers, and early childcare trainees were in attendance, many with no previous Montessori experience. The diversity of the attendees was amazing and was highlighted by the need for simultaneous Arabic and Somali translators. It was inspiring and reaffirming to witness the collective “ah-ha” moments of the attendees. There were numerous times when a new Montessori concept caused a murmur to escalate into a whisper that took over the entire room. This was certainly the case when Joen challenged the attendees to change their mindset and refrain from thinking of what a child is doing as “wrong” but instead think of it as exploration. The liveliest portion of the weekend came in response to the question, “How do you reconcile cooperation versus competition?” Non-competitive games and activities were introduced. Right away the group of women from Somalia was visibly enthusiastic and excited. Their translator explained that the game they were learning was very similar to a game that all Somali children play. Roberta Malavenda from CDF Action commented how nice it was to see so many of the attendees relaxing, having fun, and learning that many of the principles of Montessori are already a part of their culture and traditions. The games led to further discussions regarding intrinsic versus extrinsic rewards and how best to help our children develop intrinsic motivation. After the games came to an end everyone was gathered and we sang songs that truly cemented our coming together as a community. The workshop was a remarkable experience. Not only did it introduce the principles and practices of Montessori to educators who had no previous knowledge of Montessori, but it was reaffirming to witness how Montessori speaks to people from such diverse cultures and circumstances. I am looking forward to attending and participating in the next workshop – I hope we don’t have to wait too long.